This Monarch 5 light traditional chandelier in antique brass with clear glass sconces features decorative faceted clear glass balls on the stem, curved arms and candle style lights. Circular ceiling mount, chain suspension and chandelier frame, with central baluster inset with faceted glass and cut glass top sconce. Five curving arms are fitted with cut glass sconces and antique brass finish candle tubes. 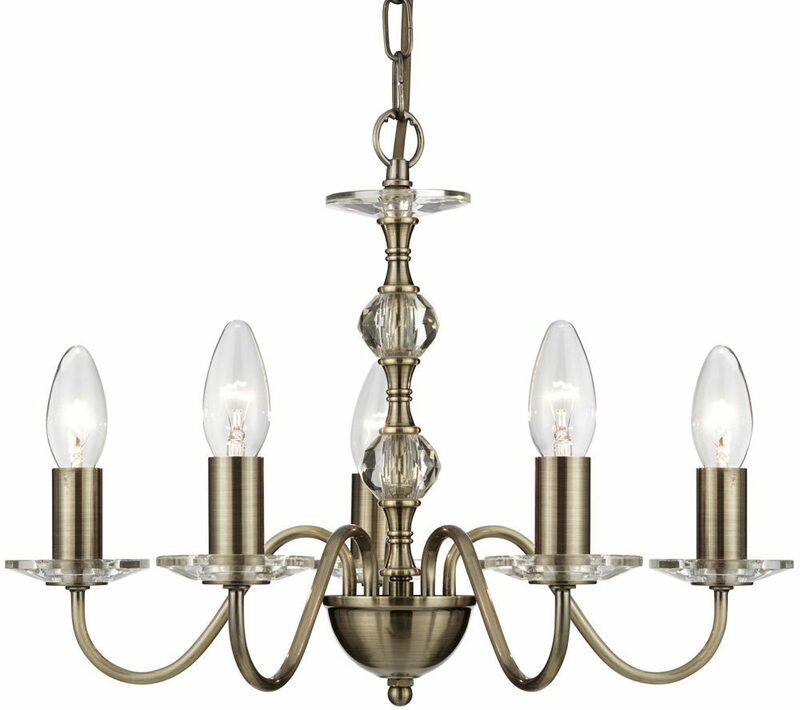 The elegant faceted glass detail, soft antique brass finish and candle style lights create a classic look that works well in any traditional dining room, bedroom or living room. This chandelier is also available fitted with cut glass shades; please see below. Height adjustable at the time of installation by removing chain links to achieve the perfect drop, please see the technical data below for dimensions. This ceiling light is supplied by Searchlight who manufacture some of the best traditional and modern classic designs such as the Monarch 5 light traditional chandelier in antique brass with clear glass sconces you see here.